My friend Denia came to me a few weeks ago and asked for help with a bridal shower. Her proposed theme was purple and orange, the color of the bride’s wedding. I pride myself on being somewhat knowledgeable about wedding etiquette, so I immediately told her that her plan was a no-go. You can’t ever compete with what a bride might have planned for the wedding! 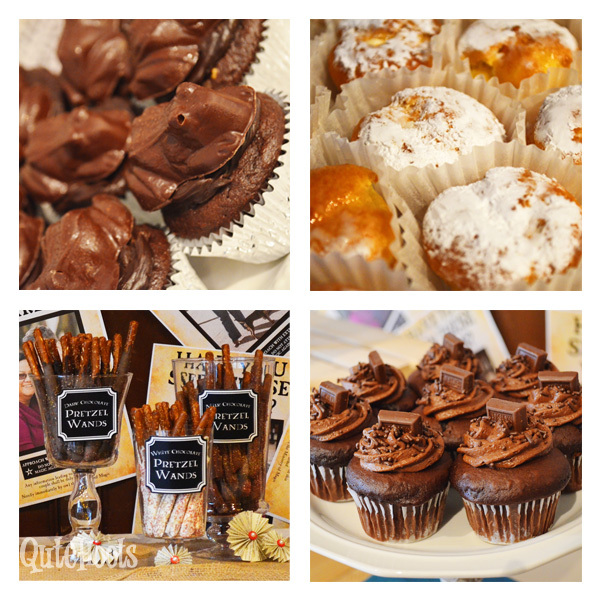 To me, bridal showers should be very personal and reflect the bride’s style and interests. 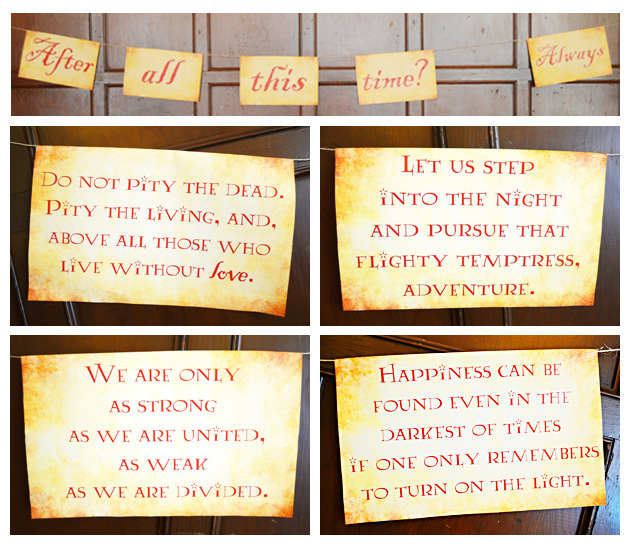 When I asked what the bride’s FAVORITE thing ever is, she said Harry Potter, and our theme was set. Since Harry Potter has such a huge fandom, there are tons of resources available for inspiration and tips. Check out some of my inspiration from my Pinterest board. 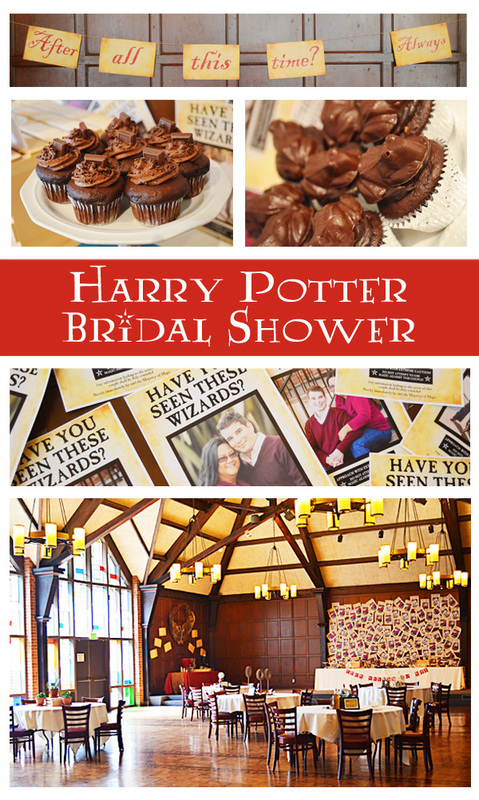 The shower theme was a surprise for the bride, Marylou, but she walked through the lobby of the building earlier that day and saw the Platform 9 3/4 sign so she had some idea of what was waiting inside for her. Sneaky, sneaky! 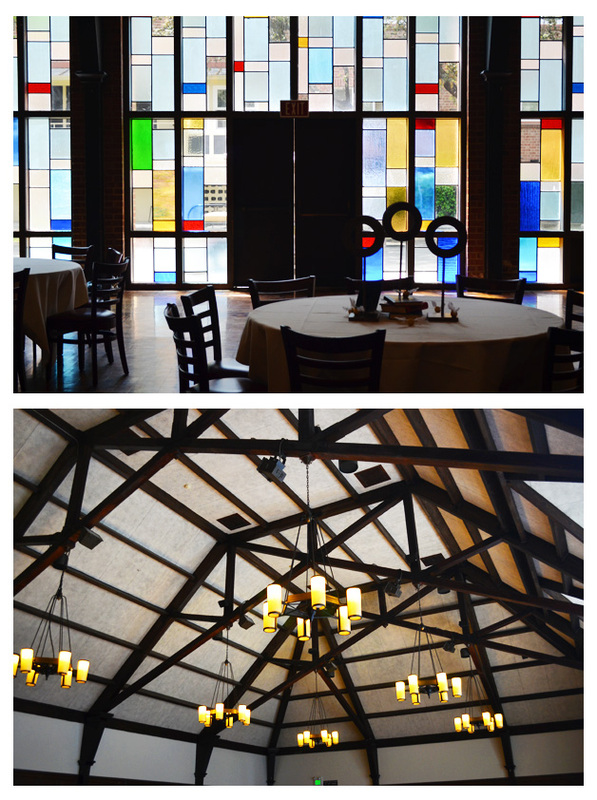 We all work at University of the Pacific, which has some great older buildings. The room we chose for the shower was Raymond Great. It seriously looks like something that you might find at Hogwarts! 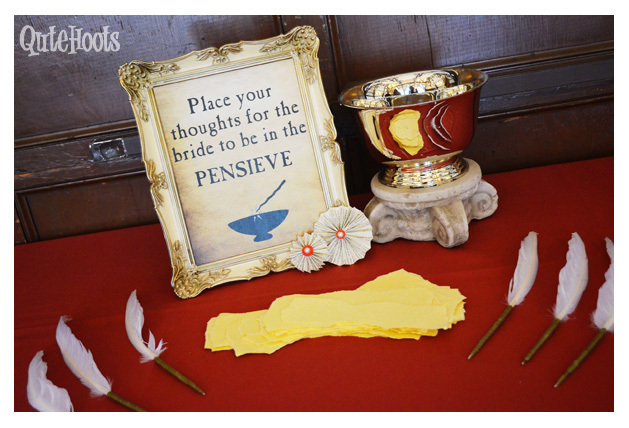 As guests arrived they were asked to put their wishes for the bride in the pensieve. 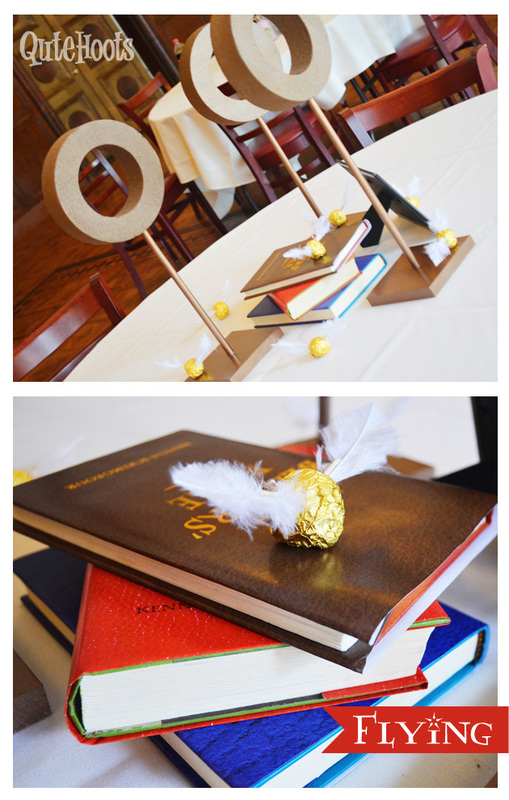 The bride was able to take each piece of parchment and put it in a scrapbook. I made the quills using craft store feathers with the insides of a pen pushed into the center of the feather with gold tape wrapped around the outside. The fonts I used for all printables were Lumos and Blackadder, but you can find even more here. 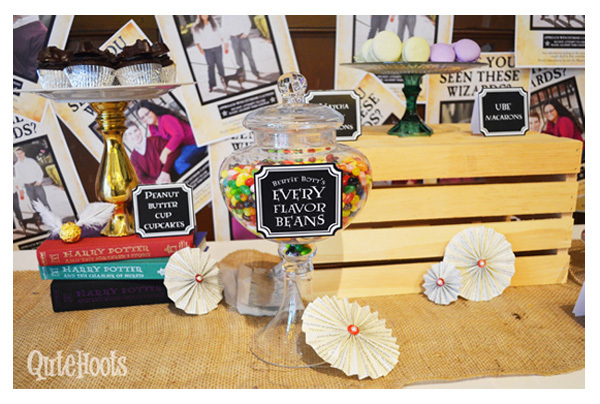 We set up five tables that were each themed according to one of the Harry Potter subjects. Each had a sign that said, “Welcome to _____”. The tables were care of magical creatures, potions, herbology, flying, and divination. 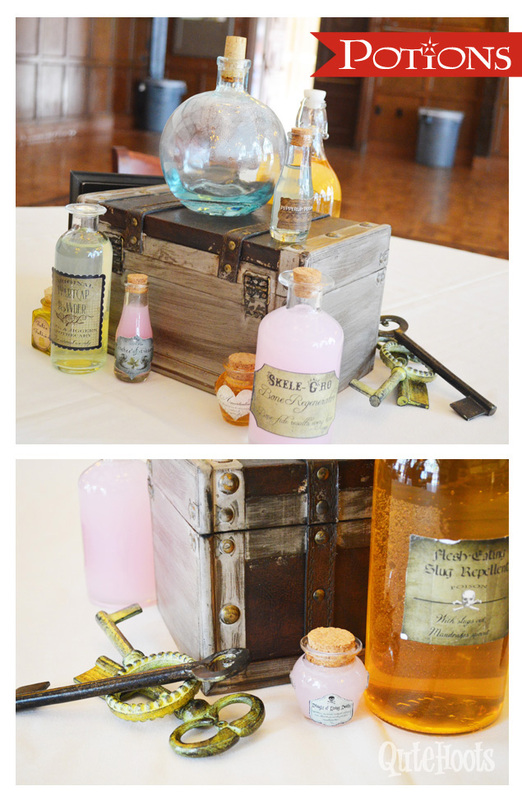 A potions table is super easy to create! You can find pre-made printable labels online, and just attach them to mismatched bottles with stoppers. Most of these came from Hobby Lobby and were fairly inexpensive. Fill the bottles with different colors of liquid, and you’re all set! For the herbology table I decided to keep it fairly simple with a trio of plants. I checked out the Harry Potter lexicon for authentic plant names and wrote them on chalkboard stakes I found at Michaels. You always want a variety of heights on a tablescape, so I added a small wooden crate. 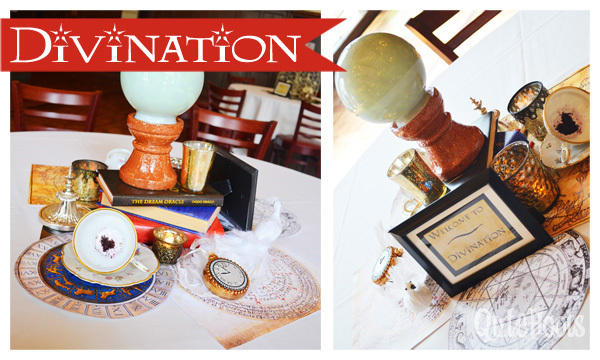 I think the divination table was my favorite! I began with star charts as a placemat and added some odds and ends that reminded me of Professor Trelawney’s class. I made a crystal ball out of a candle holder and light cover (from Home Depot). I added some flickering candles in mercury glass, a stack of books, and tea cups where the tea leaf reading shows a heart. I love little creatures! I wasn’t quite sure how to create a blast-ended skrewt or hippogriff, so I stuck to the little guys I know. 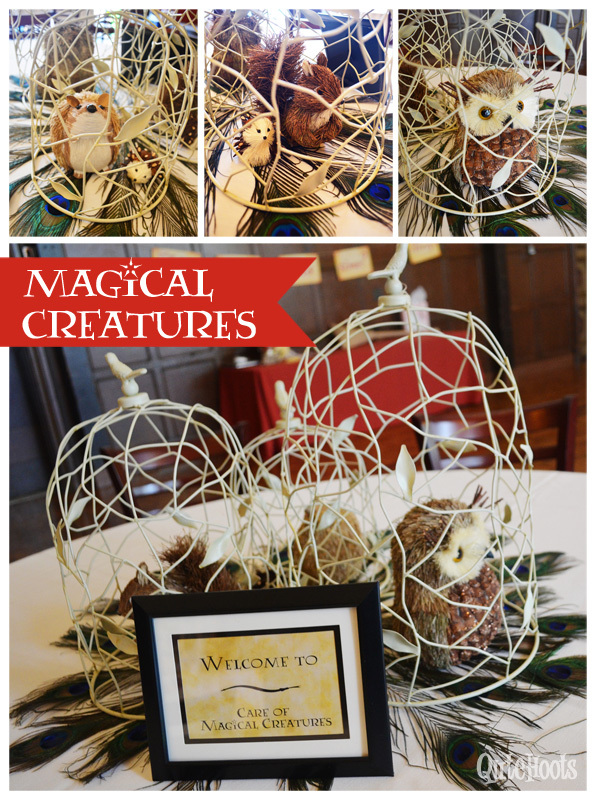 You can never go wrong with owls when it comes to Harry Potter! The flying table required a bit of craftiness on my part. I made these quidditch hoops out of dowels, styrofoam rings from the Dollar Tree, and a birch plywood base. Normally you can’t spray styrofoam (it melts! ), but these green rings held up to a couple of coats of bronze spray. My dad had to help me the base because it required use of the drill press. Ferrero Rocher chocolates with wings attached made the perfect snitches. I made book jackets with titles that were flying or quidditch related. We also had a little area perfect for a photo op. 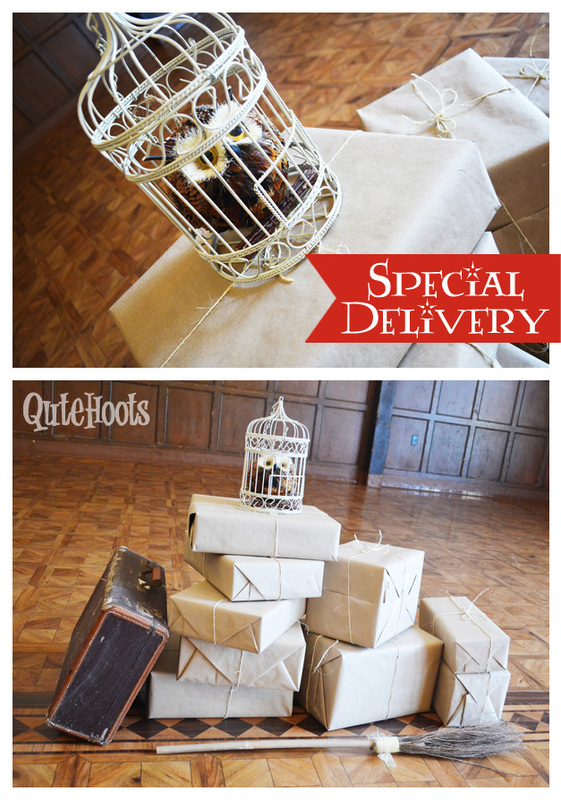 They are owl delivered packages! Get the wrapping paper at the dollar tree in the office section and use simple twine to finish off the look. And how AMAZING are these desserts? Denia’s friend, Geoffrey Beauchamp, and one of her student’s, Leah Cruz, made or purchased all of the delectable items. 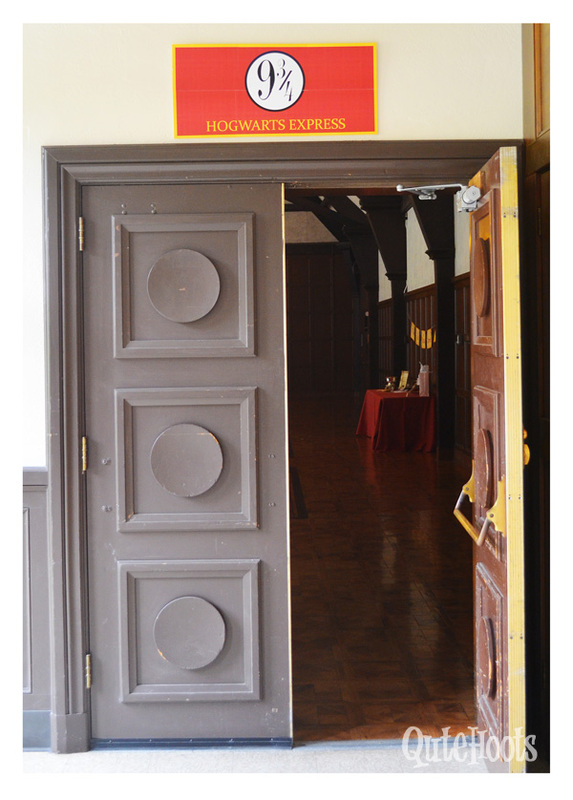 They included: chai chocolate dementor cupcakes, chocolate peanut butter cup cupcakes topped with chocolate frogs, Bertie Botts Every Flavor Beans, cream puffs, chocolate wands, and a quartet of french macarons- matcha, ube, champagne and mango. For the health conscious there was a beautiful fruit platter. 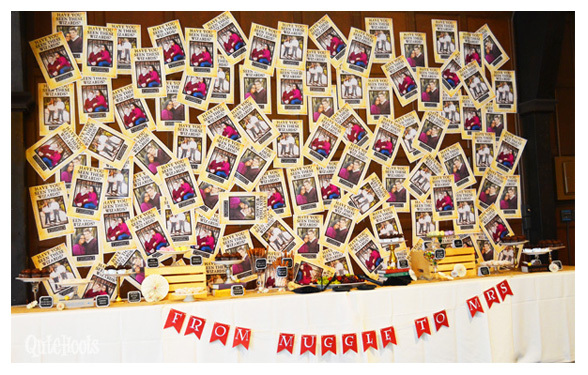 For a fun backdrop I used Marylou and Craig’s engagement photos and put them on a wanted poster. 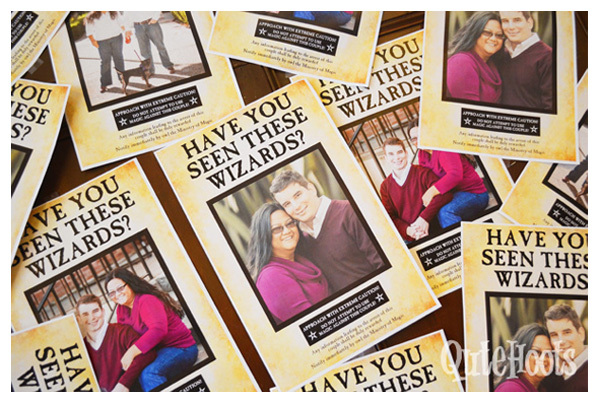 You can use my have you seen these wizards template! Check out more photos on Google + !